Sigvaris 860 Select Comfort Women's Compression Pantyhose - 863P CLOSED TOE 30-40 mmHg are made to be more comfortable and easier to put for patients who have trouble donning and taking off their pantyhose. Sigvaris 860 Select Comfort Women's Compression Pantyhose - CLOSED TOE by Sigvaris are manufactured to be durable yet very stretchable so they fit better to different body types. Colors available in suntan, natural, dark navy, black mist, white, and black. 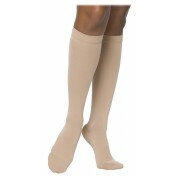 See more Sigvaris Select Comfort and Sigvaris Sports Socks.